Finding and sealing air leaks in your home is one fast and relatively easy way to take charge of your energy bill and potentially lower costs. If you think energy efficiency testing isn’t worth the time or effort, consider this: The average house has enough home air leaks to add up to a two-foot square hole. That’s like leaving a medium-sized window wide open 24 hours a day. Yikes! That might be fine on a temperate spring day, but when weather is extremely hot or cold, those home air leaks could quickly add up to some serious energy loss and higher energy costs. A smart place to start your home air leakage testing is with an energy audit. We’ve talked before about most of the details involved in an energy audit but here’s the short version: The energy efficiency test that an auditor would perform can likely find home air leaks that the average homeowner would miss. While you can do a basic look-see yourself — we’ll give some tips below — hiring a certified professional who can do thorough energy efficiency testing is probably a better place to start. A professional energy efficiency test, for instance, will include a blower door test. When hiring a professional to do a home energy audit, one of the efficiency tests they can conduct is a blower door test. This test involves sealing your home up tight and then blowing a special fan that de-pressurizes your home. The blower door testing takes place both before and after your home is sealed so that the auditor can compare home air leaks and provide potential solutions. Energy.gov notes you could save 5-30% on your energy bill by sealing air leaks suggested in an energy audit. While blower door testing is a great option if you’re looking into a home energy audit with a professional, there are a number of ways you can detect air leaks on your own with things you already have around the house. If you want to do your own home energy efficiency testing, Energy.gov offers suggestions for how to find home air leaks. By the way, you’ll need to do this home air leakage testing even if you’re leaving it to a professional; the auditor will want to know what you’ve observed yourself to help corroborate his energy efficiency test findings. Check all areas where different building materials meet on the outside of your home. In other words, if you have siding alongside the chimney, or exterior brick connected to a cement foundation, exterior corners, outdoor faucets or other places that are touching but not solid, air might be escaping or entering through a gap or crack. Check for cracks and gaps inside your home. Top spots to check include electrical outlets, switch plates, door and window frames, electrical and gas service entrances, baseboards, fireplace dampers, attic hatches, cable TV and phone lines, where dryer vents pass through walls, vents and fans, wall- or window-mounted air conditioners, and recessed lighting. Be on the lookout for cracks and gaps with leaking air possibilities. Use the flashlight method for energy efficiency testing. This is similar to the blower door test, but using light instead of air. Once you’ve found gaps, ask someone to shine a flashlight through the gaps from indoors when it’s dark outside. Stand outside and watch for rays of light seeping through. This should reveal where your cracks are, especially if they are large gaps. Shut a door or window on a dollar bill. If you can easily pull the dollar bill out, you’ve likely got a window air leak that needs to be addressed. Hold a piece of paper in areas where you suspect a leak. The paper will move if, for instance, you’ve got air coming in around an electrical outlet or window frame. Check insulation. This can be a little tricky since the amount of insulation required when your home was originally built might not be what today’s standards suggest for maximum energy efficiency. Generally, warmer air flows to cooler. Proper insulation ensures that the warm air in your home in the winter, for instance, stays in your living room rather than escaping into your uninsulated garage. An insulation’s capacity to resist heat flow is measured by something called thermal resistance or R-value. Energy.gov offers suggestions for determining adequate R-values for your home’s attic and basement. Learn more about R-value in our video. 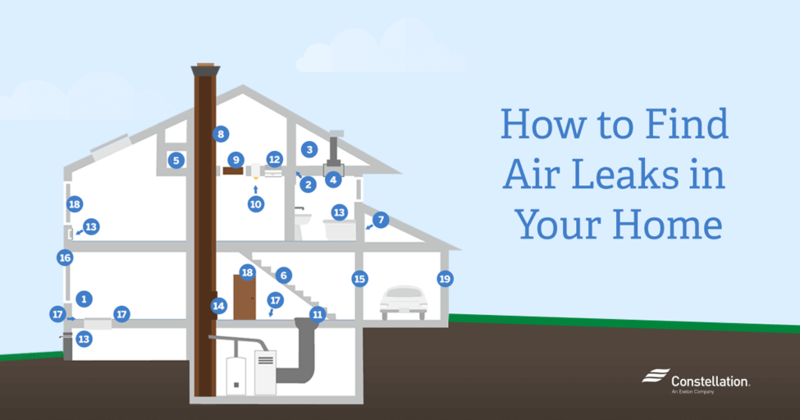 Want more ideas on how to find air leaks in your home? This illustration shows the most common spots for home air leaks. Choose a windy day to get the best result. Turn off all combustion appliances and exhaust fans. Shut all of your windows, doors, and close any fireplace flues. Light incense to create a smoke stream. Hold the incense up to window and door air leaks or drafts, and wait to see if the smoke stream changes direction. 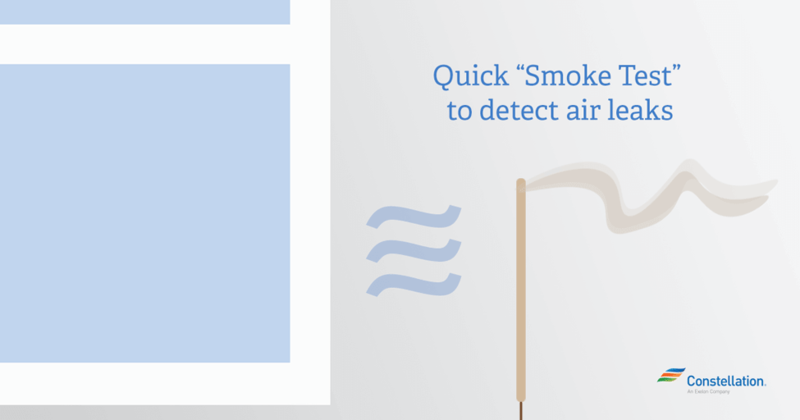 Pay attention to a smoke stream that’s interrupted by a draft or air leak sucking the air out of the room, or blowing it inward. This DIY home air leakage test will help focus your efforts once you start considering your sealing options. Okay, you’ve done your home leakage testing and you know where the major home air leaks exist. Now you’ve got to plug them up. Energy.gov offers a number options Here are some steps you can take to make that happen. Caulking: Caulking is that white (when wet) gooey stuff you can use for sealing air leaks in cracks, gaps or joints less than one-quarter inch wide between stationary building parts and materials. Caulking comes in a variety of compounds with different strengths, properties and prices. Some are water-based, while others are solvent-based. This handy Energy.gov caulking list with various properties can help you pick the right one for your air sealing project. Weatherstripping: Weatherstripping is what you should use for sealing air leaks around windows, doors and other moveable pieces. As with caulking, choosing the right weatherstripping for the job will make all the difference in the success of your seal. Not sure where to start? Energy.gov’s weatherstripping table breaks down the many types of weatherstripping and their best uses. Insulation: Since insulation is often included in a home when it’s being built, adding additional insulation for sealing air leaks can be challenging. While an energy efficiency test is a great first step, most of the time, the homeowner can’t do too much to add to insulation already in a wall. That said, the options available to the homeowner are plentiful, and by focusing on a specific area within the home you can influence your overall energy savings with a few improvements. For home energy savings information on how to improve insulation, sealing, and overall energy efficiency room by room, check out our home energy savings series: Attic Insulation and Basement Insulation. Because we can’t actually see the air, it can be the invisible culprit in higher energy usage and costs. Taking a few moments to find and repair home air leaks can make all the difference. Don’t you provide a FREE evaluation of leakage? NGRID in Rhode Island does. Please send details. Thanks for asking. We would be happy to work with you on an energy audit, or to help you find other resources that will allow you to determine whether your home is operating at maximum efficiency. In order to determine what is available in your area, please email us at feedback@constellation.com and we will be happy to help! We appreciate your reaching out!